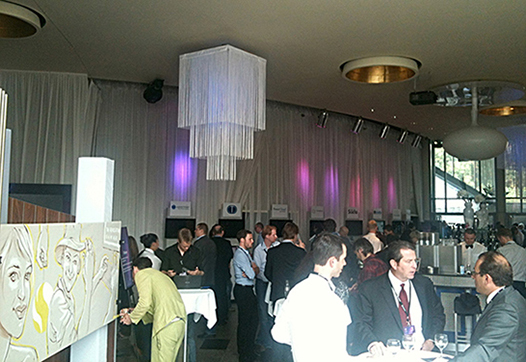 Qualcomm's IQ2012 EU event this year moved to the Kosmos Centre in Berlin. An annual one-day shindig designed to give a more regional feel to Qualcomm's roadmap presentation, it's well attended by operators, app developers and partner hopefuls. Steve Mollenkopf (President and COO) gave a good overview of the status of the mobile market and particularly how things were going for Qualcomm. In summary - very well. More chips, more devices and more innovative technologies that Qualcomm are integrating into their chip designs. Some useful demos, particularly of the next-generation SnapDragon processor and of the Augmented Reality Vuforia SDK, showed that Qualcomm are not just good with VHDL. The highlight, however, was a segment by Nokia's Jo Harlow (Exec. VP). A lot of questions persist about how Nokia will compete and whether it is worth app developers spending effort on redesign and reworking their apps to suit Windows Phone 8. Jo's presentation showed that there is still plenty of fight left in Nokia, with clever technology pieces such as wireless charging, exchangeable covers and clever hardware/software tricks in video stabilisation. Of course, Nokia gets key billing because it has included the latest Snapdragon processor in the 920 device - which received a good plug from Jo. Nokia still have an uphill battle, but with the key gadget purchasing season round the corner they are well placed to compete. Notable by their absence, though, are Apple. By fiat, no Apple devices are shown in any slideware, by anyone, in anything, despite the fact that most attendees have at least one, possibly two Apple devices in their possession. When Apple unleash their latest tomorrow, we'll see whether Nokia - or anyone else - are doing enough to convince consumers to choose them instead.